It's been a wild few days for HTC release date rumors. 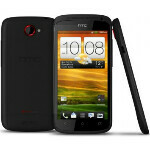 First, we heard that the HTC Titan II will hit AT&T on April 8th, then it was news about the HTC EVO ONE coming around June, and earlier today, we heard about the European release dates for the HTC One line. Now, it's time for the T-Mobile HTC One S to get its date. 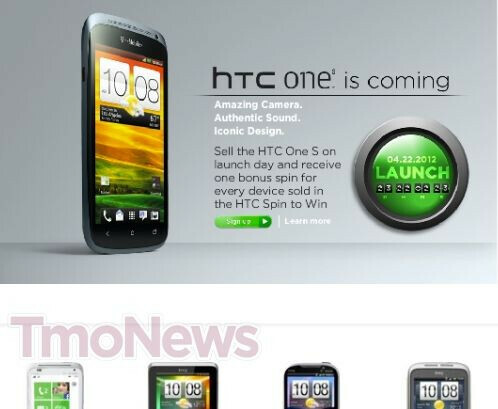 The info comes from a leaked screenshot of a website for the HTC One S with a countdown timer pointing to April 22nd. The thing is that the 22nd is a Sunday, which is an odd day for phone releases. Usually, T-Mobile will launch devices on Wednesdays or Fridays. So, we're not sure what this means. The site in question does seem to be aimed at retail stores though. The image seems to detail a competition where you would get more chances for each HTC One S handset sold. It could be something to do with referring friends for customers, but we can't be sure. Odd all around. yeah~~great!!! So looking forward to it also it's ceramic coating. I'm gonna give this a test-drive....... We shall all give this a test-drive? I have a question. This is pretty nice phone and stuff. A lot of phones are nice actually. But my question is, are we forgetting what a cell phone really is? Its like, when I first saw quad core phones, I was like ._. Wut.... I remember using Pentium computers. Lol. So many people say oh haha mines better than yours. I always say, well both can makes the calls right? So are we? LOL I still have my Pentium 120 Mhz, 16 MB Ram, custom tower somewhere. I remember being shocked how fast it was. mmm not sure, it's a museum piece! In 50 years I'll be millionaire when I sell it on ebay haha. Ha, maybe it'll be worth then the lottery right now. Let me know when the ONE X is coming to Verizon =( Won't hold my breath though. don't know why HTC removed this from the HTC india website, we are so looking forward to this phone, hope it comes back. my hands can't fit the monstrous one x..
Maybe they are counting down to the SGS3 announcement date? why not one x ? tmo lose so much customers cuz they didn't get top-end ones. will they ever learn ? i hope they will.